Stay on Mt. Carmel (past Falls Road), the school will be on your left hand side approx .75 miles. Take I83 North from I 695. Take the Parkton exit (exit 33) and make a left at the end of the ramp. Go approximately 2.5 miles. The School and fields are on the left. I-95 North to Exit 85. Follow Rt. 22 east (towards Aberdeen) to Mt. Royal Avenue. From I-95, go South and exit at Rt 32 west to Rt 29 North to I-70 west. Take exit 83 (Marriottsville Road) and turn right onto Marriottsville Road, at the second traffic light, turn left onto Rt 99 (Old Frederick Road). The park will be approximately .8 miles on your left. From I-695, take I-70 East towards Frederick, Merge onto I-70 W. Take the Marriottsville Road exit (#83). Keep right at the fork in the ramp. Merge onto Marriottsville Road. Turn left onto MD-99/Old Frederick Road..
Take I-695 to Exit 11-B and bear right onto Sulphur Spring Road and follow approx. 1 mile to school on your right hand side. Turn left at the light when you come off the ramp. Follow Rt. 543 for approx. 6 miles to the traffic signal at the intersection of Rts. 543 and 22 (there will be a Burger King on your left). Turn right at this signal on to Rt. 22; Go thru the next three signals and make a left turn immediately past the third light. The Arena Club is located behind the WaWa and the Bull on the Beach. For in-door play, enter the building through the doors on the left and go down the stairs to the field. For outdoor play, the fields are located to the right of the building. Once 702 turns into a single lane both ways, go a .5 mile, the rec center field will be on your left (across from the produce stand). Take I-695 (Baltimore Beltway) to Exit 20 South (Reisterstown Road). Go 2 - 2.5 miles and make a left on Slade Avenue. Baltimore Hebrew will be on your left; The playing fields are behind the building on the other side of the parking lot bordering Slade Ave.
Take I-695 to Exit 15-B (Route 40 West - Baltimore Natl. Pike). Follow Rt. 40 to the first traffic signal and turn left onto Winters Lane. Stay on Winters Lane 1/8th of a mile and turn left. Follow road to it deadends. Parking lot and field will be on your right. Take Beltway (I-696) to Exit 14 (Edmondson Avenue). Take Edmondson Avenue exit and head west. Follow Edmondson Avenue approximately 0.5 miles and turn right on Wesley Avenue. Follow Wesley Avenue to its end and park in Community Center parking lot. Field is a bottom of hill. Take I-95 North to I-695 East. Take I-695 East to Md Route 702 (Left hand exit). Follow Md. Route 702 to Turkey Point Road. Make a left onto Turkey Point Road and go about 1 mile. Make a left onto Bauernschmidt Drive and the field is on the right. (Bauernschmidt Drive is just past Chesapeake High School on the right). Take Exit 40 (MD 151 S) and merge onto North Point Blvd. Turn right on to Lee St. and the school is on the left. The soccer field is located in the back of the school. Take I-95 North to Exit 77B(Route 24 west - towards Bel Air) Follow Route 24 for approximately 5 miles to Route 1. Make a right on Route 1 (McDonald's on the corner). Follow to the 4th traffic light and make a right onto Kenmore Avenue. The school is the first one on the right (the second school is the Middle School). Take I-95 North to Exit 77B(Route 24 west - towards Bel Air) Follow Route 24 for approximately 5 miles to Route 1. Make a right on Route 1 (McDonald's on the corner). Follow to the 4th traffic light and make a right onto Kenmore Avenue. The school is the second one on the right (the first school is the High School). Proceed through the next three traffic signals and make the next right turn onto Belcamp Garth. Follow the road to Belcamp Park. Field is on the left. Beltway Exit 31 (Harford Road). North to Joppa Road (first traffic signal). Turn Right onto Joppa for approx. 1 1/2 miles to Walther Avenue. Turn Right on to Walther for approx 1/4 mile to the park on the left. Take I-95 south towards Washington. Get off at Route 212 (Powder Mill Road) toward Calverton (first ramp). You will go past High Point High School ( it will be on the left about 1/2 mile) down the hill to first light (Cherry Hill Road) and turn left. Follow Cherry Hill road about 3/4 mile, you will cross over I-95 make first left (Sellman Road). Follow Sellman Road past residential and make sharp left bend go about 600 yards and the entrance to the Sellman Road (Beltsville) Recreation Center will be on the left. The field is the football field to the left of the building. From Route 1 (Belair Road) Take the Bel Air By-Pass to Forest Hill/Rocks Exit 24 West. Once on Rt. 24 go to the first traffic signal and turn right on Bynum Road. Go approx. .25 miles and turn left on Melrose Road. Follow Melrose until you reach the fields on your left hand side. Bonvegna Field is located behind the Du Burns Arena in Canton. Take I-95 to the Boston Street exit, go west (toward the city approx 1.5 Miles. The field will be on your right between Clinton St. and East Ave.
Go 2.2 miles and fire dept is on right with the field behind building. From 895 (Harbor Tunnel) to I97 South. Take I97 to US 50 East. Take US 50 East to Cape St. Claire Rd. exit. Circle around the exit over top of US 50 and go to the traffic light. Turn left at the light. Broadneck Park entrance is about a half mile on the left. From I-695, take MD-295 S(the Baltimore-Washington Parkway). Continue approximately 11 miles and merge right onto MD 198 W - Laurel, Ft. Meade Rd, at the end of the exit ramp for MD 198. Go 1.4 miles and turn left at the 5th traffic light onto Brock Bridge Rd (between the BP and Crown gas stations). Follow Brock Bridge R. approximately 1.5 miles. The school will be on the left. Turn left at the second light, Smith Avenue. (The first light is the Kelly Avenue bridge). Make a left onto Cottonworth Avenue. Follow Cottonworth Avenue past the Northwest Ice Rink and Meadowbrook pool to the end of the driveway. Look for a sign on the gate saying The Bryn Mawr School. Parking is available behind the building. Merge onto I-70 W via Exit 16 towards Frederick. Take the MD-97 exit- EXIT 76- towards Westminster/Olney. Take I-695 to Exit 6-B South (Md. Route 170 Camp Meade Road). Proceed south on Camp Meade Road, (toward Linthicum) approximately 1.5 miles, to Md. Route 162, Aviation Blvd. Turn left onto Md. Route 162, Aviation Blvd. Field is on the right, less than 1 mile from intersection of Md. Route 162 and Md. Route 170. Beltway Exit 33 (I-95 North). Follow I-95 North to Exit 77A (MD Route 24). At top of ramp, make left and follow MD-24 toward Bel Air. Follow for approximately 5 miles and merge onto MD-24/US-1 N/Hickory Bypass via the ramp to Philadelphia. Continue to follow US-1 N/Hickory Bypass approximately 3 miles and turn left onto Conowingo Road/US-1 Business Route (Seasons Pizza is on the corner). Turn left onto Granary Road. Interstate 695 to Exit 32 North (U.S. Route 1- Bel Air Road). Proceed north on U.S. Route 1-Bel Air Road. At Bel Air Bypass, continue north onto U.S. Route 1- Bel Air Bypass. Proceed north on Bel Air Bypass, make a left at Water Tower Way prior to the second light. The field will be on the left side at the corner of Water Tower and Granary Road. C Milton Wright School will be on your right. The 11v11 turf field is located behind the school by following the asphalt path. Take I-95 North (portions toll may apply). Take the MD-272 N exit, EXIT 100, toward Rising Sun/Cecil College/Plumplton Park Zoo/MD-274N. Turn left onto MD-272N/East Rd. Drive 5.37 miles; turn right onto Brick Meeting House Road. 304 Brick Meeting House Rd is on the right. Landmarks as you near Calverton School include Huntingdon HS on the left and the traffic signal at Cox Road. After passing through intersection, move to left lane and continue heading south on MD Rt. 4. Once you see Mexico Restaurant on your right; Calverton School is immediately on your left. Turn left onto Calverton School Rd (at blinking yellow light); as you enter the school drive, follow the loop road (one way traffic) around the to the back of the school. Once around back the road continues to the field complex. As you enter the field parking lots, you will see tennis courts straight ahead. Veterans Field is the lower field to the right, and Alumni Field is the upper field to the left of the tennis courts. Parking is designated on the paved parking surface and on the dirt lots that boarder all four sides of the tennis courts. Port A Pots are on Site. Exit on to MD 140. Upon entering Westminster, turn left at second traffic light onto Route 97 South. Travel 3.2 miles to fifth traffic light, turn right onto Washington Road (Route 32). Carroll Community College entrance is ½ mile on the right. Fields are located to the right of the buildings. Take Route 97 North, for about 5 miles. The complex is on the right. I-695 to Exit 27 North (MD Route 146 - Dulaney Valley Road). Proceed North on Dulaney Valley Road 3 to 4 miles. Cross bridge over Loch Raven Reservoir, then bear Right to stay on Dulaney Valley Road. (Do not follow MD Route 146, which is Jarrettsville Pike). Proceed North on Dulaney Valley Road until it dead ends at Manor Road. At Manor Road, turn Left. Proceed North on Manor Road about 1/2 mile. At Carroll Manor Road, turn Right. School is on your left. Beltway Exit 33 (I-95 North). Follow I-95 North to Exit 85 (Route 22). At top of exit ramp, make left onto Route 22 toward Churchville. Follow approximately one mile and turn right onto Carsins Run Road. Fields are on the left at the third gate before you reach Route 156 (Aldino Road). From I-695 - Exit #26, MD-45 S, York Road South. At the light for Fairmount Ave, turn right into the school driveway. Playing fields are on the western edge of the campus and back up to Kenilworth Drive. For access off Kenilworth Drive, from I-695, take Exit #26, MD-45 S, York Road, South. Make a right at West Road. Make a left at Kenilworth Drive. The entrance to the school is on the left. I-695 to Exit 12 (Wilkins Avenue). Proceed West on Wilkins (toward UMBC) to Valley Road and turn Right. Proceed West on Valley Road, cross intersection with Hilltop Road to Catonsville Hight School Parking lot on the Right. Take I-695 to exit 14 West (Edmondson Avenue West). Follow Edmondson Avenue West approximately 1-2 miles. The school is on the left. From the Baltimore Beltway; take Exit #12C West (Wilkins Ave Rt. 372) away from Baltimore City towards UMBC. Follow road until Wilkins Ave. ends at S. Rolling Road (Rt. 166) and turn/bear right. Turn left onto Campus Drive (Campus Drive circles the campus). Once you made the turn on to Campus Drive, bear left at the stop sign. Follow towards stadium on your left. Take I-95 North to Exit 100 (MD 272 towards Rising Sun,. Bear left on Rt 272 N (Northeast Road). At next light turn right on Seahawk Dr. Park in upper parking lot, do not drive down gravel road to field. Beltway Exit 33 (I-95 North). Follow I-95 North to Exit 80 (Route 543 North toward Churchville). Follow Route 543 North approximately 1-2 miles to the intersection with Route 136. Turn left onto Route 136. Park will be on the right approximately .24 mile. From the Baltimore Beltway (I-695) take Exit 16 to I-70 west towards Frederick. Take the Baltimore Beltway (I-695) to Exit 19 (I-795 West). Follow I-795 to Franklin Blvd. (Exit 7A) toward Reisterstown. Follow to Reisterstown Road and make a right. Take Reisterstown road to Delight Road and make a right. The field is on the right. Follow Chapel Road to E. Joppa Road and make a left. School is on the left. Stay on Eastern Blvd (past the Glen L. Martin Airport)until you reach the school which will be on your right. Beltway Exit 36 (Rt. 702). Follow 702 approximately 3 miles to Turkey Point Road and make a left. School is approximately 1 mile on the right. Use 2nd entrance. Take I-695 to the Edgemere/Sparrows Point exit. This will put you on North Point Blvd. Take North Point Blvd. until you get to North Point Rd. where you will make a left. You will then make a right turn onto Lodge Farm Road (This is accross from Sparrows Point High School). The school is on the right hand side of Lodge Farm Rd. Go approx. 1 mile to the park. Take I-95 North, Take Exit 80 (Rt. 543). Go left onto Rt. 543/Creswell Road. Turn right at Churchvill Rd. Field 7 is the last field on the left. To right turn into Longwell Parking Grage and Municipal Lot. The park is across the street; weekend parking is free. I-695 to 83 North. Proceed up 83 to Exit 18 (Warren Road). Go East on Warren to 3rd traffic light. Turn Right on Greenside Drive. School is on your left; fields are behind school. Keep left at fork in the ramp and turn left onto Middletown Rd. Stay on PA-851 to a 4-way stop; Go straight at the 4-way stop on Rte. 516. Follow for about one mile to a right turn onto Rockville Rd. The field will be on the right. Take the Beltway to Exit 29 (Cromwell Bridge Road). Turn left at the bottom of the exit ramp. Turn left at the light at Cowpens Avenue (Loch Raven High School is on this corner). Proceed down Cowpens to Concordia Drive. Turn left at Concordia Drive and Baltimore Lutheran School is on the left. I-95 North to the White Marsh exit (Rt. 43 East). Take Rt. 43 east to the Route 7 exit. Turn right onto Rt. 7; Go to first traffic signal and turn left onto Cowenton Ave.
Go apprx. .5 miles (just past the I-95 overpass) and turn right into the fields. Turn right onto N Center St.
Go 300 yards and turn right to Field #2. Take Exit 77A (Route 24S - Emmorton Road)toward Edgewood. School is located at the first traffic light on right side. Turn Right onto Lyons Mill Road and follow it to the school. Continue on East Drive around the lake; Turn left onto Red Road; Pass Safety City on the left, a football field on the right, and as road veers to the left the soccer field will be on the right. Take exit 7 for 28th Street & Druid Park Lake Drive; keep right at the fork to get onto Druid Park Lake Drive. After passing the lake, take the first right onto Swann Drive. As road curves to the right, Swann Drive becomes East Drive. 1301 S Ellwood Ave. is on your right. Travel 10.2 miles and the school will be on your right. Go approx .25 miles and turn right on Killoran Rd., Killoran becomes Hartfell Rd. Go 2 blocks and the the school which will be on your right. Take Exit 39 (Merritt Blvd), proceed about 2 1/2 miles. At the 8th traffic light (intersection of Merritt Blvd - Peninsula Expressway and Merritt Ave) turn right. If you cross RR tracks you've gone too far. At the first traffic light, Merritt Ave becomes Sollers Point Road. Go Straight. The college is at the top of the crest on the right. Turn right into the college and continue straight to the baseball field on the right. Road bears to the right, then follow straight to the end. Park in the end lot, you will see the lights to the field at the end of the parking lot. I-695 to Exit 39 (Merritt Blvd.). Continue south on Merritt Blvd. Pass through 8 traffic lights. At the railroad tracks, veer off to your right to get onto Dunmanway. After the second traffic signal, the school is on your right. Exit onto Merritt Blvd, and turn right on Dunmanway, follow to Sollers Point and turn right. I-95 to Eastern Avenue Exit (Route 150 West). Follow Route 150 West over the railroad tracks to the first light. Make a left onto Kane Street. Follow Kane Street to a dead-end at Dundalk Avenue. Make a left onto Dundalk Avenue and follow it for aproximately 2 miles to American Legion Post 38 (on the right). The field is behind the American Legion building. Go aprox. 11 miles and turn left onto N. Center St. Turn right onto Key St. Turn right onto Longwell Ave.
Stay on Eastern Blvd (past the Glen L. Martin Airport), when you have passed Carroll Island Road (approx 1/4 mile) look for the park entrance on your right hand side. Stay on North Point Rd. until you rech the school on your left. I 95 North to exit 77 (rte 24) towards Edgewood. This will take you to the main gate. Be prepared to show photo ID with vehicle registration. Enter the Rte 24 main gate onto APG Edgewood area, turn left at the traffic light (Magnolia Rd), then right at the next light (Wise Rd). Continue to the next traffic light (soccer field will be on your left side). Park in the parking lot that is directly across from the soccer field. The 11v1 field is on the left facing the High School in the front. Take I-95 North to Route 152 (Mountain Road). Make right onto Mountain Road, towards Edgewood. Cross over Rt. 40. Mountain Road turns into Magnolia. Take 2nd left onto Trimble Road. Go about 1 mile and the fields will be on the left. Stay on Dale until you reach the school on your left. As you reach the City of Bel Air follow the Belair Bypass. Stay on the by-pass; the name changes to Hickory Bypass and then to Conowingo Road. Note that when you cross over Rt. 136, the park is located 1.75 miles away, the field/paqrk & parking will be located on your left. Take I-95 North to Exit 77B (Rt. 24/Bal Air). Follow Rt. 24 to the third traffic light (Wheel Road) and turn left. Follow Wheel Rd. to the traffic circle, go 3/4s around the circle onto Tollgate Road. Fields are on the right. CMSA Field is located directly being the school building; and is assessible on foot from the right side of the building. Proceed West on Rt. 152. Cross Belair Road, then cross Harford Road. Continue approx. 4+- miles past Harford Road. Turn right onto Carsmill Road, school is located at the bottom of the hill; and the field is located in the back of the middle school building. Park in the front of the school and walk behind the school to the fields. Parking is not allowed behnd the school. Beltway to I-95 North to Exit 74 (Fallston-Magnoia Exit). Proceed West on 152. Cross Belair Road, then Harford Road. Continue abouth 5 miles past Harford Road. Fields are on your right. Interstate 695 to Exit 33 North (I-95). Proceed north on 95 to Exit 77 North (MD Route 24). Take Rt. 24 north approximately 8 miles. At Bel Air Bypass (US Rt. 1) proceed north. Stay straight on Bel Air Bypass to 2nd exit (MD Rt. 24 North- Rocks Spring Road). Exit is marked "Rocks". Stay north on Route 24. Go past the 3rd traffic light. Turn left at Rock Spring Church Road. Make next left at tennis courts. Complex is at the end of Randy Blair Drive. I-95 to Exit 77B. Follow Rt. #24 North to Osborne Rarkway. Turn left, school is on your right hand side. Go approx. 3 miles to the fields which will be on your right just prior to Fort Howard Park. Take exit 27B, Dulaney Valley Rd (MD 146) - north 15 miles, turn right on MD 152, fields will be 1/4 mile on your left. From Bel Air: Travel North on Rt. 1 towards Conowingo Dam. Go to Route 623 and turn right(Head of the Bay antiques is on the right). Go to stop sign and turn left. Go 1/4 mile and the park will be on the lefthand side. The field is behind the pavilion. From I-95 in Havre de Grace: Take Rt. 155 West. Follow Rt. 155 until you reach Rt. 161 (approx. 3 miles). Turn right onto Rt. 161 (Darlington Road) and follow for 6.5 miles towards Darlington. Turn right onto Quaker Road. Go to the stop sign and make left onto Shuresville Road. Go 1/10th of a mile and the park is on the right. From the Baltimore Beltway, take Exit 19 (I-795) North towards Reisterstown. Turn into the FSKHS parking lot; the field is down the hill past the baseball fields. Take I-695 to Exit 19 (I-795 Northwest Expressway). Take I-795 to Exit 7A (Franklin Boulevard East). Proceed through first traffic light and then turn left onto Owings Court (if you hit second traffic light on Reisterstown Rd., you've gone too far). 795 to Exit 7A - Franklin Blvd. - East. Take to Reisterstown Road. Make left onto Reisterstown Road. Go about 2.5 miles to Cockeys Mill Road and make a left. Franklin Middle School is on right. Drive past school and park across the street from the fields at Franklin Elem. School. From the Baltimore Beltway (I-695) Take I-70 exit towards Frederick; Take Exit 53B for US 40 Gettysburg; keep straight onto US 15N/US 40 West; At exit 14 take ramp right and follow signs to Rosemont Ave.; Bear right onto W 2nd Street;Turn right onto Fairview Avenue; Turn left onto Carroll Parkway. Go .2 miles and bear right into Private Rd. ; Go 75ft and turn right onto private Rd. ; Go .1 mile and turn left onto private Rd. Go 66 feet and you have arrived at FHS. FROM THE NORTH: Take I-95 south to exit 74 (Rt. 152) Turn left on Rt. 152 - go approximately 2 miles Turn right on Rt.40 - go approximately 5 miles Turn right on Allender Road, Freestate Indoor Sports Arena is .2 miles on the left. FROM THE SOUTH: Take I-95 north to exit 67A (Rt. 43) Follow Rt. 43 to Rt. 40 Turn right (east) on Rt. 40 and follow to the second traffic light Turn left on to Allender Road Freestate Indoor Sports Arena is .2 miles on the left. From Rt. 1 (Belair Rd) follow the Bel Air By-pass to Forest Hill / Rocks Route 24 North exit. Once on Route 24 follow to the 5th traffic signal and turn right on Jarrettsville Rd. Friends Park is on your right just after the fire station aprox. 1/4 mile from intersection. or Take I-95 north to Exit 77B ( Route 24 North to Bel Air). Stay on Rt. 24 to Forest Hill. At the traffic light in Forest Hill ( Jarrettsville Road ) turn right. Field is on the right, just past the fire station behind Friends Pond. Take I-695 to Charles Street exit. Take Charles Street south off exit ramp for 4.7 miles. Turn right at second light south of Charles Street and Northern Parkway intersection. There is a large stone sign indicating Friends School. Take I-83 North (Harrisburg Expressway) to Exit 31 (Middletown Rd); From the South, turn left off of the ramp at the 3-way stop onto Middletown Rd. (If traveling from the north (PA)veer right off of the ramp onto Middletown Rd. Continue down Rayville Rd less than a half mile; the entrance is your left at 1717 Rayville Rd. Please take 2nd left into athletic field parking lot. Baltimore Beltway to Rt. 795 N.
Merge onto MD-140 via exit 9B towards Westminster. Turn right onto Old Westminster Pike, the school will be on your right. Take I-70 west toward Frederick. Exit at Marriottsville Road and take a left at the end of the ramp onto Marriottsville Road. Continue across Route 40 on Marriottsville Road and turn left onto Frederick Road (Route 144) at the stop sign. Continue ½ mile and turn right onto Folly Quarter Road. Continue 3 miles to a roundabout. Go ¼ of the way around and take the first exit onto Folly Quarter Road toward Glenelg. Continue 1.4 miles to the school on your left. At next traffic circle, take the 1st exit to continue onto Burntwoods Rd. I-695 to I-795 North. Take the 2nd Exit (Franklin Blvd.) West towards Reisterstown Road. Turn left (North) on to Reisterstown Road. Go to Bond Avenue and turn Right. Turn Left on to Glyndon Drive. The school will be on your right hand side. From the Baltimore Beltway (I-695) take exit 31C for White Marsh Boulevard east. Continue on White Marsh Boulevard for approximately 3.5 miles and make a left onto Honeygo Boulevard. Proceed north on Honeygo Boulevard; and go 200 yards past the entrance to Honeygo Park and turn right into the Gough Park parking lot. From the East: From the Baltimore Beltway (I-695) take exit 33 for I-95 north. Continue on I-95 north for approximately three miles and take exit 67 for White Marsh Boulevard west (towards White Marsh Town Center). Proceed to the first stoplight and make a right onto Honeygo Boulevard; and go 200 yards past the entrance to Honeygo Park and turn right into the Gough Park parking lot. I-95 north to exit 89 (Havre de Grace). Bear left on Rt. 155. Follow to Paradise Rd. and turn left. Go approx. 1 mile and turn left onto Gravel Hill Rd. Fields will be on the left. From I-695 take Exit 32 North (Belair Road, Route 1). Proceed approx. 4 miles North on Belair Road. Turn Left on Baker Lane from Belair Road and proceed to Holiday Manor Road. The school will be on your right. Bear right at the fork in the ramp. From I-695 take Exit 27N Dulaney Valley Road. Approx. 1/4 mile turn Left at Charmuth Road (2nd traffic signal). School will be on your Right side approx. 1/2 block. Take I-695 to Exit 19 (I-795 Northwest Expressway). Take I-795 to Exit 7A (Franklin Boulevard East). Proceed to Reisterstown Road and turn left (North). Go approx .5 to 1 mile; and turn right into the entrance of the site. Follow the road to to back of the complex and the fields. Take I-95 North to Route 22 toward Churchville. Go South on Rt. 22 for 4-to-5 miles. Make right on Thomas Run Road. Field is on right inside the track. I-695 to Exit 30 North (Perring Parkway). From Perring Parkway, bear right at the first traffic light (Joppa Road). Proceed to 3rd traffic light and make a left on to Old Harford Road. The school will be on your immediate Left (across from the Amoco Station). Take I-95 North to Route 22 toward Churchville. Go South on Rt. 22 for 4-to-5 miles. Make right on Thomas Run Road. School will be on your right hand side, across the street from the Community College. Road now becomes becomes Rt. 763. Turn right onto Juniata Street. Follow Juniata St. to the end, and make right on to Revolution St. Follow to Lewis La. and turn right, school is on the right. Lighted turf field is just past the school on the right up the hill. Take I-695 to I-83 North. Go east on the Belfast Road exit. Turn left on York Road. Turn right on Corbett Road. Take I-695 to Exit 18 (Rt. 26 - Liberty Road) west. Follow Rt 26 until you reach Mariottsville Road, make Left onto Mariottsville Road. School is within 1 mile on the left. Take Exit 9 for Cold Spring Lane (left at the top of the ramp to go East. ; Drive 2.7 miles and turn right onto The Alameda; Drive 1.2 miles and turn left on East 33rd Street; Drive .4 miles and stay in the right lane at the multi-way intersection at Rt. 41 (Perring Parkway and Hillen Rd.) and go straight across (turns into 32nd St. as it bears to the right); Drive .2 miles and turn left onto Harford Rd. ; Drive .4 miles and turn right onto Chesterfield Ave. Fields visible immediately on your left. ; Field number four is nearest Harford Rd but on the north side of the park (opposite Chesterfield). Take Perring Parkway to 33rd St. and make a left turn (turns into 32nd St. as it bears to the right). Drive .2 miles and turn left onto Harford Rd. Drive .4 miles and turn right onto Chesterfield Ave. Fields visible immediately on your left. Field number five is nearest the Harford Rd and Chesterfield intersection at the northwest corner of the park (the first field you come to when on Chesterfield off of Harford Rd). Drive 4.8 miles and take exit 11a for 95 North toward Baltimore; Drive 10 miles (pay harbor tunnel toll) and take exit 60 for Moravia Rd. ; Drive 2.3 miles on Moravia and turn left onto Belair Rd; Drive .6 miles and turn right onto Chesterfield Ave.; Drive .4 mile and the fields will be visible on your right just before Harford Rd. ; Field number five is nearest the Harford Rd and Chesterfield intersection at the northwest corner of the park (the first field you come to when on Chesterfield off of Harford Rd). After coming through harbor tunnel (toll), take exit 60 for Moravia Rd. ; Drive 2.3 miles on Moravia and turn left onto Belair Rd. ;Drive .6 miles and turn right onto Chesterfield Ave. ; Drive .4 mile and the fields will be visible on your right just before Harford Rd.Field number five is nearest the Harford Rd and Chesterfield intersection at the northwest corner of the park (the first field you come to when on Chesterfield off of Harford Rd). Turn left and follow Rt 1 (Conowingo Rd) to the school which will be on your left. I95 North to Exit 80 (Rt. 543). Turn left onto Rt. 543. Go approx. 12 miles. Complex will be on your left hand side (approx. 1.5 miles past Rt. 1 intersection). From the Baltimore Beltway: Take I-95 south to the Calverton/Beltsville exit. (Exit # 29) Md. Rt. 212 west toward Calverton. There will be a shopping center immediately on your right. Proceed on Md. 212 through two lights. As you climb the hill High Point will be on your left. There is a traffic light at the western entrance near the football field. Turn left onto MD-543 (N. Fountain Green Rd). Continue to follow MD-543 approx 8 miles and turn left onto Highland Road. Go approx 1.3 miles to field. Turn right on Highland Road, field will be on your left. From I-70 take Route 32 north approx. 7 miles (towards Sykesville/Eldersburg) until you reach Route 26 (Liberty Road). At Route 26 (Liberty Road) turn left. Go .5 mile and turn right onto Johnsville Road. Go .5 mile and turn left on Bartholow Road (Liberty HS will be off to your right). Turn right on Hodges Road and go .25 mile and turn left into the park. Follow the stone road .25 mile to the parking lot. The soccer field is beyond the first ball diamond. I-695 to Exit 39 (Merritt Blvd.). Go south on Merritt, through five traffic lights, to Holabird Ave. Go west on Holabird to Delvale Ave. and turn right. School is on the right. From the Baltimore Beltway (I-695) take exit 31C for White Marsh Boulevard east. Continue on White Marsh Boulevard for approximately 3.5 miles and make a left onto Honeygo Boulevard. Proceed north on Honeygo Boulevard for approximately one mile and make a right into the park entrance just past the overhead pedestrian bridge. From the Baltimore Beltway (I-695) take exit 33 for I-95 north. Continue on I-95 north for approximately three miles and take exit 67 for White Marsh Boulevard west (towards White Marsh Town Center). Proceed to the first stoplight and make a right onto Honeygo Boulevard. Follow Honeygo Boulevard north for approximately one mile and make a right into the park entrance just past the overhead pedestrian bridge. To reach the 8v8 field from the parking lot, you must walk over Honeygo Blvd. via the pedestrian bridge. Take Exit 38 B towards Columbia (RT 32 WEST). Go about 4 miles. Take Exit for Cedar Lane, Turn Right on the exit ramp. Go up Cedar Lane about 2 miles until you see Howard County General Hospital. Turn Right onto Little Patuxent Parkway. Go about ½ Mile, HCC will be on the Right. Go past main entrance (about 700 feet) and take entrance road to right that leads to parking garage. Exit parking garage and take path around pond (from backside of garage) to athletic fields. Follow the walking path to access the park. I-695 Baltimore Beltway to Dulaney Valley Rd North (Exit 27). Follow Dulaney Valley Rd. North. Cross over the Loch Raven Reservoir Bridge and bear right to remain on Dulaney Valley Rd. Stay on Dulaney Valley Road until it ends at Manor Rd. Turn right onto Manor Rd. and take first left onto Hydes Rd. Go about 1 mile to the fields which will be on your right. I-695 to Exit 27 (Dulaney Valley Rd.). Proceed approx. 3-4 miles to Loch Raven Reservoir Bridge, then bear left to continue up Rte. 146 (Jarrettsville Pike). Continue another 2 miles north. The school is on the right. Make right and head east at MD-Route 23, Norrisville Road, for almost 2 miles. Jarrettsville Rec Complex on Right. Go approx .5 miles and the park and fields will be on your right. Baltimore Beltway (I-695) to I-795 North (Exit 19) to Owings Mills Blvd, go east on Owings Mills Blvd to traffic light at Gwynnbrook Road. Make a right on Gwynnbrook Road and JCC is a 1/2 mile on the left. Follow drive way around to the right of the building; athletic fields will be on your right. Take I-695 to I-95 North. Take Exit #74 (Mountain Rd., Rt. 152) and go to top of the ramp. Turn right (East) on to Mountain Rd. Mountain Rd. turns into Magnolia Rd. Turn right on to Trimble Road. School will be on your left. From the north of Baltimore County take I-95 south to exit 67 West (route 43) Stay in the right hand lane and bear right at the light at Honeygo Blvd. The school is on the right about 1/2 mile. Or from the south of Baltimore County take I-95 north to exit 67 West (route 43) Get into the right hand lane and bear right at the light at Honeygo Blvd. The school is on the right about 1/2 mile. Take Exit 33 North onto I-95. Proceed north on I-95 to Exit 77 North (MD Route 24) towards Bel Air. Take MD Rt #24 North approximately 5 miles. Proceed straight thru traffic light at Rt #1 (Bel Air Road Business) at Harford Mall. Make your next right turn on to Boulton St. Caution: Parking is located on the opposite side of street from the fields. Please walk your player across the street to the field. 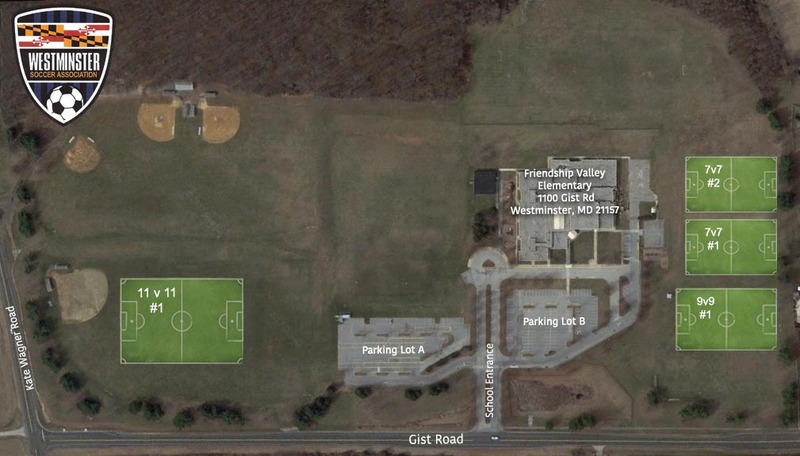 4v4 field is located next to the parking lot located to the right of the school (when facing the school). 7v7 field is located behing the school up the hill. Parking is available on both sides of the school; please observe all posted signes regarding parking restrictions. From I-695 take Belair Road North to Bradshaw Road (Kingsville, MD). Make a right on Bradshaw, stay on Bradshaw for approx. 1 mile, then turn Left on Franklinville Road (if you go past St. Stephens Church/School, you've gone approx. 2/10 of a mile past Franklinville Road). Once on Franklinville Road, the park will be on your right. Field # 2 is the first field on the left as you enter the park. The lower level fields are located in the rear of the park on the right, continue on into the park until you see the lower fields on the right. Beltway to Exit 32 North (Route 1, Belair Road). Go to 2nd red light (Rossville Blvd). Make a right. Go to 2nd red light (Lillian Holt Drive) make a Right. Immediately after crossing over bridge, park is on right. Take I-695 to Exit 18. Follow Liberty Road to Eldersburg. Cross over Route 32 and go two miles to traffic light at Linton Road. Turn right onto Linton Road. Make left onto Romsdale Road and then turn left into Linton Springs Elementary School. 695 to Exit 29 (Loch Raven Boulevard). Stay straight for approximately 1.6 miles then turn right onto Taylore Avenue. Go 0.2 miles and make right on Pleasant Plains Road (there will be open fields on the left). Take I-695 to Exit 29 (Cromwell Bridge Road). Stay straight to Cowpens Avenue. Turn right. School is on the corner of Cowpens Avenue and Cromwell Bridge Road. I-95 North to 695 West to Exit 25-Charles Street. Proceed south 1.25 miles to traffic light at Chestnut Avenue. Turn left on to Chestnut Avenue and enter campus at the second entrance on the left. I-95 South to 695 West to Exit 25-Charles Street. Proceed south 1.25 miles to traffic light at Chestnut Avenue. Turn left on to Chestnut Avenue and enter campus at the second entrance on the left. I-83 to 695 East to Exit 25-Charles Street. Proceed south 1.25 miles to traffic light at Chestnut Avenue. Turn left on to Chestnut Avenue and enter campus at the second entrance on the left. From the beltway, go north on York Road. The school is located across the St. from Best Buy. The fields are in the rear of the school. Turn right onto York St and go approximately 2 blocks, the school is on the Left. Go 1 miles and turn right onto Old Frederick Rd (MD-99). Turn left onto Woodford Dr, Marriottsville High School is on your right. Stay on Falls Road 1.25 miles north to the Maryvale Prep entrance which will be on the left. Take 83 North to Padonia Road exit. Go west on Padonia Road for approximately 1 mile. After two traffic lights turn right onto Roundwood Road (no traffic light at turn, but look for signs for "Grauls Supermarket"). The field and parking is about 2/10 miles on the left. turn right on Monroe St.
Go three blocks and turn right on Pennsylvania Ave. The fields are located on the other side of the lots maintainence building. FROM THE BALTIMORE BELTWAY (695) Take the Northwest Expressway (795) Exit to Exit 4 (Owings Mills Boulevard) and bear right off the exit to the Town Center/Owings Mills Boulevard. Proceed through two traffic lights until the road ends. Turn left onto Lyons Mill Road, continuing to the traffic light. Turn right onto Painters Mill Road, then left at the next light onto McDonogh Road. The Shell Road entrance is the second drive on the left. Proceed to the top of the hill. Parking is available in the visitor's lot on the right. Cross Maitland St, Cross Giles St, and make a right turn onto Ewing St just prior to the bend in the road. Go to the end of Ewing street to the parking lot.
. Go to the end of Ewing street to the parking lot. From Baltimore: I-695 to I-95 South to Route 175 East toward Ft. Meade. After passing I-295, pass CVS Drug Store (Disney Road) and make right onto MacArthur Road. ALTERNATE ROUTE: I-695 to I-295 (BW Parkway) South to Route 175 East toward Odenton. Pass CVS Drug Store (Disney Road) and make right onto MacArthur Road. Field #1 – Once on MacArthur, the athletic fields are immediately on the left. Field #1 is the field nearest the road. Parking is available just past the fields in the school’s parking lot. Parking is also allowed on the shoulder of MacArthur Road. From the Baltimore Beltway (I-695) take exit 23B for Falls Road north, and immediately proceed to the left lane. Make a left at the first stoplight onto Falls Road south, and proceed to the park entrance just ahead on the right (marked by park sign). Special Event over-flow parking will be available at the State Highways Administration complex located on Joppa Road. Follow the same directions as above, but you will turn right at the first stoplight onto Joppa Road and proceed .25 miles to the complex on your right. All parking must be on the left along the field, there is no parking on the right in front of the houses. From 695: Merge onto I-795 N via Exit 19 toward Owings Mills[Reisterstown. Go 8.7 miles and merge onto MD-140 W via Exit 9B toward Westminster. Go 3.8 miles and turn left onto MD-91 (Gamber Road). Go 3.1 miles and turn right onto Rt. 32 North (Sykesville Rd.). Go less then 1/2 mile, Mechanicsville Elem. School will be on your left. Park in the School Parking Lot and walk behind the school along asphalt path, over the small bridge and up the stairs to the field on the mesa. Do not park or unload passengers on small access road next to the field as it is private property. From I-695, Take Exit 18 North towards Randallstown. Go approx 3 blocks and turn right on to Washington Avenue. Go approx .5 miles and the school will be on your left hand side. Take I-83 N to MD-439 exit, EXIT 36, toward Maryland Line/Bel Air. - Turn right onto Old York Rd/MD-439. - Turn slight right toward MD-45 N/MD Line. - Stay straight to go onto York Rd/MD-45 becomes Susquehanna Trail at PA Line. Turn left at the stop light onto N. Constitution Ave. – Follow N. Constitution Ave. about ¼ of a mile to a left onto Miller Park Drive (just past the YMCA). Follow Miller Park Drive all the way up. The field is on the right of the pavilion. Take Exit 19 and merge onto I-795 N toward Owings Mills/Reisterstown; Exit at Owings Mills Blvd. Bear left (south) on the ramp toward Town Center/Randallstown; Merge onto Owings Mills Blvd. and go to Lakeside Blvd. Turn right onto Lakeside Blvd. ; Turn left onto New Town Blvd. The elementary school will be on your immediate right. Soccer fields are located in the far left rear with the baseball diamonds. Exit at Owings Mills Blvd. Merge onto Owings Mills Blvd. and go to Lakeside Blvd. Turn right onto Lakeside Blvd. Turn left onto New Town Blvd. The high school will be on your immediate left. Continue to the Route 30 bypass and continue to the 3rd traffic circle. Continue onto Business 30(Hanover Pike), at second light make right into school entrance, continue behind the school and park. Note for evening/night games using lighted fields only: Fields will be located on the lower level, 100 yards beyond the parking lot. Turn Right onto Schuster Rd. Turn Left to stay on Schuster Rd. Turn Right onto Md 23/Norrisville Rd. Turn Left onto Md 165/Federal Hill Rd. Enter next roundabout and take 2nd exit onto Md 165/Pylesville Rd. Turn left onto MD 165 / Pylesville Rd. I-695 to Exit 39 (Merritt Blvd.). Go south on Merritt, through five traffic lights, to Wise Ave. Turn left onto Wise. Turn right from Wise into first driveway on the right. Fields and parking are behind building. (Renamed W.E.B. DuBois) 2201 Pinewood Ave. - Take I-695 to Exit 30 South (Perring Parkway). Take Perring Pkwy to Northern Parkway and turn right onto McClean Blvd. Take McClean and turn right onto Pinewood Avenue. From the North - Take Jones Falls Expressway (I-83) south to Northern Parkway. Proceed right (west) on Northern Parkway for a very short distance to the FIRST right turn; West Rogers Ave. Follow the road for about 1/2 mile to the park which will be on the left. From the South - Take Jones Falls Expressway (I-83) north to Northern Parkway. Take the second Northern Parkway exit (west). Stay in the right lane on Northern Parkway and go for a short distance to the FIRST right turn; West Rogers Ave. Follow the road for about 1/2 mile to the park which will be on the left. Directions from points east of the intersection of I-795 and I-695: From the Baltimore Beltway (I-695) take exit 19 for I-795 towards Owings Mills. Continue on I-795 for approximately 3 miles and take exit 4 for Owings Mills Boulevard south towards the Owings Mills Town Center. Stay on Owings Mills Boulevard until its end at Lyons Mill Road and make a right. Proceed on Lyons Mill Road for approximately 1.8 miles and make a right onto Deer Park Road. The park entrance, marked with a sign, will be just ahead on the right. Directions from points south of the intersection of I-795 and I-695: From the Baltimore Beltway (I-695) take exit 18 for Liberty Road west towards Randallstown. Follow Liberty Road for approximately 5 miles and make a right onto Deer Park Road. Stay on Deer Park Road, past Lyons Mill Road, and proceed to park entrance just ahead on the right (marked by park sign). I-695 to Exit 39 (Merritt Blvd.). Go south on Merritt, through five traffic lights, to Holabird Ave. Go west on Holabird to Delvale Ave. and turn right. School is on the left. Go north on Providence Road. Turn Left onto Hampton Road. School will be on the left. I-695 to Exit 34 (Philadelphia Rd., Rt. 7). Go East (becomes North within 1 block) on Philadelphia Rd. to King Ave. Turn left on to King Ave. and go approx. 1 mile to the fields which will be on the right hand side of the road. I-695 to Exit 29 (MD Route 542 - Loch Raven Blvd.) South on Loch Raven Blvd. Turn Left onto Joppa Road. At first traffic light, turn Right onto Oakleigh Road. Turn Left at first traffic light onto White Oak Road. At top of hill, turn left. Field is on the left. From Towson: Take Beltway 695 (south) to Rt. 97 (south). Go approximately 4 miles to Rt. 100. Stay on Rt. 100 towards Gibson Island (not towards Columbia). After approximately 2 miles take the first exit towards Oakwood Road. At the traffic light, turn right onto Oakwood Road. Stay straight for approximately 1 mile and then turn right at the traffic light onto Shetland Drive. Stay stright for approximately 2-3 blocks, and the field will be on the right prior to the school. From Key Bridge: Take 97 South to Exit 3 towards Annapolis. Stay straight until Rt. 100. Take Rt. 100 south towards Gibson Island (not towards Columbia). From this point, follow the directions "From Towson" located just above these directions. Take Belfast Road Exit and go right (east). Go approx 8 miles and turn right onto Grace Quarters Rd. Westbound - Take I-695 to Exit 25 north (Charles Street). Turn right onto Bellona Ave. and proceed approx. 2 blockes, the fields will be on the right. Eastbound - Take I-695 to Exit 25 (Charles St.) turn left at the top of the ramp, turn right onto Bellona Ave, the fields will be on the right. I-695 to I-83 North. Take the Shawan Road Exit (Hunt Valley) West. The fields will be located approx. 1/2 mile on your right hand side. Go approximately 1/2 mile and make right into parish entrance. Fields will be on right of entrance by the pavilion. Take I-695 to Route 1 South (Belair Road). Make a left onto Kenwood Ave. The school is on the right approximately 2 miles. Take 695 to Exit 29 South on Loch Raven Blvd. Stay straight on Loch Raven Blvd for approximately 2.5 miles and turn right on Loch Hill Road. Then make a left onto Regester and continue straight for 1 block. The field will be the on the right hand side. Turn left onto Reisterstown Road and go approx. 1 mile to Tollgate Rd. Turn left onto Tollgate Road to traffic circle and bear right and continue on Tollgate until you reach the school which will be on your right side. Take I-695 to Exit 31A (Harford Road). Take Harford Road South to Putty Hill Road. Turn right onto Putty Hill Road. School is on Putty Hill Road. One field is on the school side, one field is across the road from the school. Take I-695 Exit 31 South (Parkville) to Harford Rd. Proceed south on Harford Rd. The first traffic light is the intersection of Putty Hill Rd and Harford Rd. The old Parkville Elementary School (where center is located) is on the left about a block past Putty Hill Rd. Turn left onto Hiss Ave from Harford Rd and right onto the parking lot. The entrance to the senior center is in the back of the building facing the parking lot. located off of Lindwood Ave. between Baltimore St. and Eastern Avenue. From the Baltimore Beltway (I-695) take exit 31C for White Marsh Boulevard east. Continue on White Marsh Boulevard for approximately 3.5 miles and make a left onto Honeygo Boulevard. Proceed north on Honeygo Boulevard for approximately 2.5 miles to Rt.1 Bel Air Rd. Go left for 1/4 of a mile. Turn right onto Schroeder Ave. School is 1/4 mile down on the left. From the Baltimore Beltway (I-695) take exit 33 for I-95 north. Continue on I-95 north for approximately three miles and take exit 67 for White Marsh Boulevard west (towards White Marsh Town Center). Proceed to the first stoplight and make a right onto Honeygo Boulevard. Follow Honeygo Boulevard north for approximately 2.5 miles to Rt.1 Bel Air Rd. Go left for 1/4 of a mile. Turn right onto Schroeder Ave. School is 1/4 mile down on the left. Take Belair Road (Rt 1) North from I-695 Make a right on Joppa Road. School and fields are on the right. Fields are to the left of the parking lot, down the hill. The recreation activity room entrance is on the left hand side of the building, look for the activity room sign. From the Baltimore Beltway (I-695) take exit 33 for I-95 north. Continue on I-95 north for approximately three miles and take exit 67 for White Marsh Boulevard west (towards White Marsh Town Center). Proceed to the first stoplight and make a right onto Honeygo Boulevard. Follow Honeygo Boulevard north for approximately 2.25 miles to the park. Take I-695 (Baltimore Beltway) to Exit 20 South (Reisterstown Road). Go 2 - 2.5 miles and make a left on Slade Avenue. Go to the 2nd light and turn left on Seven Mile Lane. The school is on the right. Playing fields are directly behind the school. I-695 to Exit 30 North (MD Route 41 - Perring Parkway). Proceed North on Perring Parkway to Joppa Road. Turn Right onto Joppa Road. Proceed East on Joppa Road to Old Harford Road. Turn left onto Old Harford Road. Proceed North on Old Harford Road, through the intersection with Proctor Lane. Go to the next street Summit and make left. Fields on left. I-695 to Exit 30 North (Perring Parkway). Bear to the right off Perring Pkwy to Joppa Rd. Go to third traffic signal and turn left onto Old Harford Rd. Proceed approx. 1/2 on Old Harford. School is on the left (across from St. Isaac Jogues). Exit at I-83 North. Go to Timonium Road West (Exit 16). Go west on Timonium Road and turn right on Pine Valley Drive (the first right). Take your third right on Sandee Road, then take your first left on Rickswood Road. School is at end of the Rickswood Road. Take I 695, Baltimore Beltway, to I 70 west to Route 32 (Exit 80). Bear right to go north on Route 32. Follow Route 32 past the traffic light at Springfield Avenue and turn left onto Freedom Avenue. The VFD is on the corner. Follow Freedom Avenue to the school located on the right. At the 1st Light turn left onto Pleasant Plains Road, School will be on your left. Do not drive down the road to the field on the right. You must park in the upper parking lots. For spring 2016; all C.M.S.A. games are being played on field #1 which is the soccer field lined in orange located closer to the school. Take 83 North to Padonia Road exit. Head east on Padonia Road for approximately 0.5 miles (crossing over York Road and Eastridge Road). Go through the light on Eastridge Road and make the first right onto Hartfell Road. Then make the first left onto Fallsbrook Road and then make the immediate left onto Spring Lake Drive. The school is on the left hand side and the parking lot is on the right side of the school. The field is behind the parking lot. I95 North to Exit 80 (Rt. 543). Turn left onto Rt. 543. and go approx. 6 miles. Turn right at the 5th traffic light onto Rt. 22. Turn left at the 1st light onto Prospect Mill Road. School is on the right. Important Park Notice: Only park in the actual parking lot of the facility! There is a small road that runs along side the field that many parents are tempted to use. The local neighbors will have your vehicle towed immediately. I-695 to Exit 18B (Md Rte. 26 - Liberty Rd.). Proceed west on Liberty Rd. to Offutt Rd. Turn right on to Offutt. Go about 1 mile. School is on the left. Go north on Belair Road (Rt 1). Turn right onto Mountain Road (Rt 152). Field is 1/2 mile on the right. Or go north on I 95. Take the Mountain road exit west. Go 2 -3 miles Field is on the left. I-695 to Exit 34 (MD Route 7 - Philadelphia Road). Turn Right onto Philadelphia Road. At Golden Ring Road, turn Right. Proceed West on Golden Ring. Turn Left on Weyburn Road. At Burnfield Road, turn left. Field will be on your right. Continue to follow MD-152 and turn slight right onto Old Fallston Rd. Carrs Mill Rd becomes Vale Rd. I-695 to Exit 29 ( MD Route 542 - Loch Raven Blvd.). South on Loch Raven Blvd. Turn Left onto Joppa Road. At first traffic light, turn right onto Oakleigh Road. Turn Left at first traffic light onto White Oak Road. At top of hill, turn right. Field is on the left. From the Baltimore Beltway (I-695) take exit 19 for I-795 towards Owings Mills. Continue on I-795 until the end following signs for Route 140 towards Westminster. Make a left onto Mitchell Drive immediately after the expressway merges with Route 140. The park entrance, marked with a sign, will be just ahead on the right. Continue to follow US-1 S.
I-695 to Exit 23 North (Falls Road). Proceed North on Falls to Joppa and turn right. Head East on Joppa to Thornton Road (where a Royal Farm Store is located) and turn Left. School is approx. 1/2 mile on the left. 6916 Charles Street. Beltway to Charles Street (Exit 25). Take Charles Street South toward the city. School is approx. 1 mile inside the Beltway on the right. I-695 to Exit 26 North (York Rd.). If you are approaching York Rd. from the West, exit ramp takes you to West Rd. Make a left onto West Rd., then make a left onto York. Proceed North on York Rd. At Ridgely Rd., make a right. School is on your right at Ridgely & Charmuth Rds. Take I-95 North to Exit 77A (towards Bel Air). Go 3.5 miles on Rt. 24 and turn right on Plumtree, stay on Plumtree to Rt. 924 (Emmorton Road)and turn left. Follow road approx for one mile to Ring Factory ES which will be on your on your left side. Beltway Exit 33 (I-95 North). Follow I-95 North for 14 miles to Exit 80 (Riverside/Churchville). Turn right at top of ramp. You will now be on Riverside Parkway. Follow approximately one mile to where Riverside Parkway merger with Route 40 East. Go east on Route 40 East for 1.4 miles to Spesutia Rd. and make a right. Follow Spesutia Road 0.7 miles and bear right onto Chelsea Road. Follow Chelsea Road (must bear left) 1.6 miles and field will be on the left. I-695 to Exit 33 North (I-95). Head north on 95 to Exit 74 (Mountain Rd.). Proceed east (South) on Mountain Rd., across US Rte. 40 (Pulaski Hwy. ), to Trimble Rd, which is the second traffic signal after Pulaski Hwy. Proceed west on Trimble Rd. to school. Bear right off of the exit ramp on to Edwin Raynor Blvd which will become Fort Smallwood Road. Park will be on your left. Go approx. 3.2 mile and turn left onto Bellona Ave. Turn slight right onto Dumbarton Rd. School will be on your left. Take to Cold Spring Lane exit. Go East on Cold Spring to Falls Road. Make a right and head south on Falls Road for about a mile to 36th St. Take a right on 36th street and the rec center will be on your left, with the field being just west of the center. Take to 28th St exit, take a right and head north on Sisson St. Veer to the right onto Keswick (at the light). Take Keswick to 36th St. and take a left onto 36th heading west. Take 36th with a slight left right jog at Falls road to stay on it, and the rec center will be on your left after the Falls Rd jog. with the field being just to the west of the center. Take I-695 to exit 35 (Philadelphia Rd) Go west (toward Baltimore City) on Philadelphia Road. Turn left onto Neighbors Ave. Turn left on Old Philadelphia Road. The field is behind the school on the left. Go west (toward Baltimore City) on Philadelphia Road, once you cross over Golden Ring Road, go approx. .25 miles and turn left into the park entrance located across the street from Golden Ring MS.
Take I 695 to exit 19 I 795 N toward Owings Mills/Reisterstown. Merge onto MD 140 W. via Exit 9B toward Westminster. You will bear right off of the exit. This will put you onto Rt. 140. Follow this for about 15.7 miles. You will pass McDaniel college, and the fields before you make a right onto Mayberry Road. The entrance to the school is about 1/2 block on your right, Langdon Drive. The fields are in back of the school. The address is 3000 Langdon Drive, Westminster, Md. 21158. From 695. Exit 27B, Dulaney Valley Rd (MD 146) - north 16 miles, right on MD 23, fields 1/2 mile on left. Go straight through the signal, this is now Butler Road. Stay right, Approx. 3/4 mile on Butler, turn right onto Sacred Heart Lane. Approx. 1/4 mile, turn right into Sacred Heart Church parking lot. The entrance to Father Hooper Field is towards the back of the parking lot. Turn left onto Jericho Park Road. Turn right at the first cross street to stay on Jericho Park Road. Turn left onto Chelmont Lane. Merge onto Route 140 West. Follow approximately 6 miles and turn left onto Green Mill Road. Turn right onto Old Westminster Pike. Fields will be immediately on the right. Follow I-795 North to Route 140 West Exit. Follow Route 140 West approximately 13 through Westminster and turn left on Route 31 toward New Windsor. Follow Route 31 approximately 7 miles and turn right onto Route 75 toward Union Bridge. About 150 yards on the right is the driveway entrance to the fields (directly across from New Windsor Middle School). From I-695 take Exit 25 North - Charles Street. At the traffic circle bear right to Bellona Ave. Continue to Seminary Ave where you will make a left. Take Seminary Ave to the road on your left just before the bridge that crosses over I-83. This road runs parallel to Seminary Ave. Stay on this road and turn left onto Burton Ave. The fields will be on your right. Take the Baltimore Beltway (I-695) to Exit 7 (Baltimore Washington Parkway - Rt. 295) towards Washington. Take exit 9 (Rt. 100) towards Glen Burnie. Take exit 11 (Rt. 170 - Telegraph Rd) south towards Odenton. Turn left onto Rt. 174 (Donaldson Ave.
Take the second left into Severn Danza Park. From 95 or the Beltway, take I-695 east towards Essex. Take Exit 34 (Philadelphia Road, towards Rosedale). At the first stop light, make a right onto Golden Ring Road. Travel about 2/10 of a mile and make right onto Delegge Road. At the stop sign, make a right onto Goldenwood Road. Shady Springs Elementary School will be on the left. Go to the end of the expressway and take the (MD-30 North, Exit 9A) on the Left towards Hanover. Go .1 mile (pass North Carroll HS) and turn Right on Panther Drive, Panther Drive turns into Willow Street after the 4 way stop, go .3 miles and field is on the right side behind the school. From Belair MD. Take Route 1(Bel Air Rd) South. Make left on Chapel Rd (just past the Safeway shopping center, there is a light and a 7-eleven on the corner). Proceed on Chapel Rd approx .5 miles and make a right on Snyder Lane. Park entrance will be on your left. From I-95 north or south: Take I-95, to exit 67, White Marsh Blvd/RT 43 west, turn right at the first traffic light, Honeygo Blvd. Follow Honeygo Blvd to the 3rd traffic light and turn left onto Joppa Road. The first right turn onto Chapel Rd, go appox. 1.5 miles and turn left on Snyder Lane. The park entrance will be on your left. From Baltimore Beltway I-695 Beltway Exit 32 North (US Route1) and head North on Belair Rd. into Perry Hall. Turn right on to Joppa Rd (first light after Ebenezer, after passing Perry Hall ES). Proceed on Joppa Rd. approx 3/4 mile to Snyder Lane and turn left. Field entrance is approx. 1 mile on right. Take Exit 39 and follow Merritt Blvd until you reach Sollers Point Road. At the traffic circle, take the 2nd exit to stay on Sollers Point Road. From I-695 take Exit 18 Liberty Road West (Rt. 26). Stay on Liberty Road approx. 15 miles thru Eldersbutg. Continue past Rt. 97, school will be on your right hand side. When you see the Winfield sign prepare to turn right into the school's parking lot. Take Rt 1 North (Bel Air Rd) through the town of Bel Air. This turns into Rt 22 east. Turn left onto Moores Mill Road. School is on the left. OR Take I-95 North to exit 80, take 543N (approx. 5.5 miles) to route 22W (1/2 mile), right on Moores Mill Road, school is 1/2 mile on left. Take I-695 N; Take Exit 24 to I-83 N toward York. Exit at Belfast Road (Exit #24) marked Butler/Sparks, Take the ramp toward Butler. Take I-695 E to MD-151 S ( Exit # 42- towards Sparrows Point). Merge onto North Point Blvd. Turn left onto Bethlehem Blvd. Go to North Point Road and turn right. School will be on your left. After 12 Miles turn left and take Route 32 south; after 1 mile take a left into Springfield Hospital Center on Main St. Firestation will be on the right. Field is at the corner of Main St and 2nd Avenue inside of the Springfield Hospital Center. Take the 2nd left onto Myrth Ave.
Interstate 695 to Exit 39 (Merritt Boulevard). Continue south on Merritt Boulevard to 4th traffic light (Holabird Avenue). At Holabird Avenue, turn right (west). Proceed west on Holabird Avenue to Dundalk Avenue. At Dundalk Avenue, turn left (south). Proceed south on Dundalk Avenue approximately 1.5 miles. At Willow Spring Road, turn right. Proceed south on Willow Spring Road to park. Parking is on your right. Take I-695 to exit 27 North, Dulaney Valley Rd. (MD-146). Continue on 146 N for 10.1 miles. Turn LEFT at light onto MANOR RD. Bear left at fork in front of Manor Tavern. School entrance is 200 ft ahead on right at Church. Go straight back driveway and park. Field is behind school on left. 8416 Belair Road. I-695 to Exit 32 North (Belair Road). Proceed approx. 1 1/2 miles North on Belair Road. From I-695 (Baltimore Beltway), take exit 23-B Falls Road. Follow Falls Road north to traffic signal at Seminary Avenue. Turn left into St. Paul's; the parking lot will be on your right. From I-695 (Baltimore Beltway), Go to Greenspring Avenue. Go .8 of a mile and turn into the school at the main entrance. Follow the road and bear right around the athletic field and look for the gym on your left hand side. Please park in the designated areas, not on the road. I-695 to Merritt Blvd (Exit 39). Continue south on Merritt approx. 7 traffic lights to Peninsula Expwy and make a left. Go to Chesterwood Rd. and turn left. Go to Stansbury Rd. and turn left, and make a right into Stansbury Park. Take the Baltimore Beltway (I-695)to Exit 15 (Route 40 West). Take Rt. 40 and make a left at first light onto Winter’s Lane. Make left at first road onto Old Frederick Road. Field is on right at the end of the road. Take I-695 to Exit 22 (Greenspring Ave.) North. Go approx. 2.5 miles to Greenspring Valley Road and turn left. Go approx .5 miles to the college entrance and turn left into the college. At the stop sign turn right and follow the road to the rear of the complex and the gym. Enter the complex and bear right around the main building to the access road leading to the fields which are next to and overlooking the stadium. Turn right on Diana Road, the school building will be on your left. The field is located behing the school. Take Exit 27B (MD 146 north) onto Dulaney Valley Road. Bear left onto Jarrettsville Pike. Make a right onto Sweet Air Road. Sweet Air Park is a half mile on your right. Go 5 miles and turn Left onto Springfield Avenue and stay on Springfield Avenue .5 miles to Sykesville Middle School on left. Take the first exit and bare right onto Owings Mills Blvd. The school will be .5 miles on your left. I-695 to Exit 26 North (York Road). Go north and turn right onto Ridgely Road. Go to Eastridge Road (adjacent to Ridgely MS) and turn left. The school will be approx. four blocks on your right hand side. From I 695 - Take Bel Air Road (MD Business RT#1) North towards Bel Air. Turn left onto Tollgate Road (just prior to Harford Mall). Continue straight for 2 miles and the fields will be on the left. From I 95: Take MD-24 NORTH - go 4.9 miles, then turn Left on Bel Air Rd - go 0.2 miles, Then turn right onto N Tollgate Rd - go 1.2 mi, arrive at Tollgate Park & Sunset Dr. Fields will be on the left. I-695 to Exit 27 South (Dulaney Valley Rd.). Head south on Dulaney Valley to Towson Traffic Circle and turn right into the Circle. Follow Circle counter-clockwise to York Rd (3rd turnoff). Proceed south on York Rd. to Aigburth Rd., across from Towson University, and turn left. The school is on the right; walk across bridge to fields. Parking is available at the school, or along Leafy Hollow Circle or Park Ridge Drive. Street Parking is only allowed along the field side of the street. PLEASE NOTE: the above address is for the Arbutus MS which is located directly across the street for the UMBC fields. The fields are fensed in and only has one entrance which is located by the small gravel parking lot. Go 1.7 miles, crossing overpass bridge. Turn right on Wellington Valley; Park is 500 yds. on your right side. Go about 1 mile to school on right. From I-695, take the Jones Falls Expressway (I-83) south to Exit 9 (Cold Spring Lane West). Take Cold Spring Lane heading west and turn right on to Tamarind Road. FROM SOUTH: From I-696, take I-83 North. Take Exit 18E (Warren Road) to Bosley Road and turn right. Take Bosley to intersection of Lakespring Way. School will be on your left. From I-695 Take I-95 South towards D.C.
Take Exit 38 (Route 32) East and proceed to 1st Odenton exit (Route 175 East). Continue on Route 175 to Route 170 and turn right. Follow to 2nd light, Waugh Chapel Rd., and turn left. Proceed approximately 1.5 miles and turn left on Indian Summer Drive. Turn right on Sunflower Drive and school is straight ahead. Take I-695 (Baltimore Beltway) to Exit 20 South (Reisterstown Road). Go 2 - 2.5 miles and make a left on Slade Avenue. Go thru the 3rd traffic signal (the high school will be on your left). The school will be one block past the signal on your right. 12500 Frederick Road West Friendship, MD 21794 From intersection of Rts. 29 & 32 in Columbia, take Rt. 32 to Frederick Road (Rt. 144). Turn right and stay on Frederick Road until you reach the school which will be on your left. From intersection of Rts. 70 & 32, take Rt. 32 East (South) to Frederick Road (Rt. 144). Turn left on to Frederick Road. School will be on your left. Exit #26, MD-45 S (York Road). Turn right on Bosley Ave. Turn right on W. Joppa Rd. Turn left on Highland Ave. Park is on the left. I-695 to Exit 17 West (Security Blvd.). Proceed West on Security to Rolling Road. Turn Left on Rolling Road, Go under I-70. Park will be on your left, make first left on Crosby Road and make next left at Adamsview. Field will be on your left hand side. Park on Road. From the Baltimore Beltway (I-695): Take Exit 16 to I-70 west towards Frederick. Take Exit 76 onto Rt. 97 South. Go south on Rt. 97 approx. two miles and turn right onto Carrs Mill Road. Go .03 miles and turn right, into the park. Take I-83 North to Exit 36 (MD-439) toward Maryland Line/Bel Air. Turn right onto Old York Rd/MD-439. Stay straight onto York Rd/MD-45 which becomes Susquehanna Trail at the PA Line. Take I-695 to Exit 34 (MD Route 7- Philadelphia Road). Turn right (west) at top of exit ramp onto Philadelphia Road. Continue straight until Golden Ring Road. Turn right onto Golden Ring Road. Continue west on Golden Ring Road. Turn left onto Weyburn Road. Continue straight on Weyburn Road past the school until the four-way stop sign. Proceed through intersection and the field will appear on the left hand side. From I-695: take I-95 North to Exit 77-B (MD Rt 24). Bear right at the first light on to Emmorton Rd. (MD 924). Follow for approximately 2 miles. Make a right onto Box Ridge Dr (M&T Bank is on the corner). At stop sign, proceed straight into the school parking lot. Follow parking to lot in the rear. From Bel Air: follow MD 24 East towards I-95. Make a left on Singer Road. At first light make a left on to MD 924. Make a right onto Box Ridge Dr (M&T Bank is on the corner). At stop sign, proceed straight into the school parking lot. Follow parking to lot in the rear. Go .1 mile (pass North Carroll HS) and turn Right on Panther Drive, Panther Drive turns into Willow Street after the 4 way stop, go .2 miles and field is on the Right. Take Exit #20 ( Reisterstown Road; Rt. 140 ) south towards Pikesville. Turn right on to Old Court Road. Turn right onto Scotts Level Road. School will be approx. one mile down on your left. Field will be in the back of the building. From 695, take Exit 18-Liberty Road/26 West. Continue on Liberty Rd/26 W for 16 miles. Turn right onto Salem Bottom Road (after South Carroll High School). Turn right into the school parking lot, the field is straight ahead. Site administrators, please click here to Login. ©2019 Central Maryland Soccer Association. All rights reserved.